In their senior year, select top students in the Mechanical Engineering Department may opt for the Accelerated Masters Program, in which students conduct individual research under faculty advisement as their Senior Design Projects. This research continues after graduation with a B.S. into the M.S. study and forms the basis for the M.S. thesis. In this way, a student may earn the M.S. degree one calendar year from graduation with a B.S. degree. 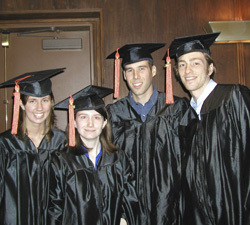 An Accelerated M.S. student will gain exposure to high-level research topics sooner, starting from the undergraduate senior year. Typically, under the advisement of the same advisor, the student will carry out their senior design course sequence and the subsequent M.S. degree research in a continuous manner, thereby increasing research productivity. An Accelerated M.S. student will be able to combine coursework at both undergraduate and graduate levels towards the M.S. study. Typical M.S. Plan A course work includes 7 courses (4 core courses, 1 math, and 2 electives; please refer to the Mechanical Engineering Graduate Handbook). In the undergraduate senior year, the student can take up to two ME graduate-level (5000-) courses that fall into the M.S. Plan A coursework requirement and can use them toward the undergraduate plan-of-study (e.g., as ME electives). When the student enters the M.S. study, in lieu of those two courses, the student can choose to sign up for two independent-study courses with the advisor to focus on the specific research. This generally expedites the student’s M.S. curriculum progress. Almost all students working on research projects are financially supported during their M.S. study (after finishing the B.S. degree). Typical financial support includes monthly stipend, full tuition waiver, and highly subsidized health insurance under the Graduate Assistant plans. The Accelerated Masters Program is only applicable to M.S. Plan A (thesis option). A student cannot have a time gap between the undergraduate study and the following M.S. study. In your junior year (or even earlier), contact faculty members who might serve as your advisor and sponsor your M.S. study. Finalize the mutual agreement with your advisor no later than the end of Summer session (before the Fall semester of your senior year starts), and notify the Director of Graduate Studies (Dr. Jiong Tang) and the Senior Design Director (Dr. Vito Moreno). Submit a regular graduate application in your senior year before the deadline (Feb 1 for Fall admission into the graduate program).